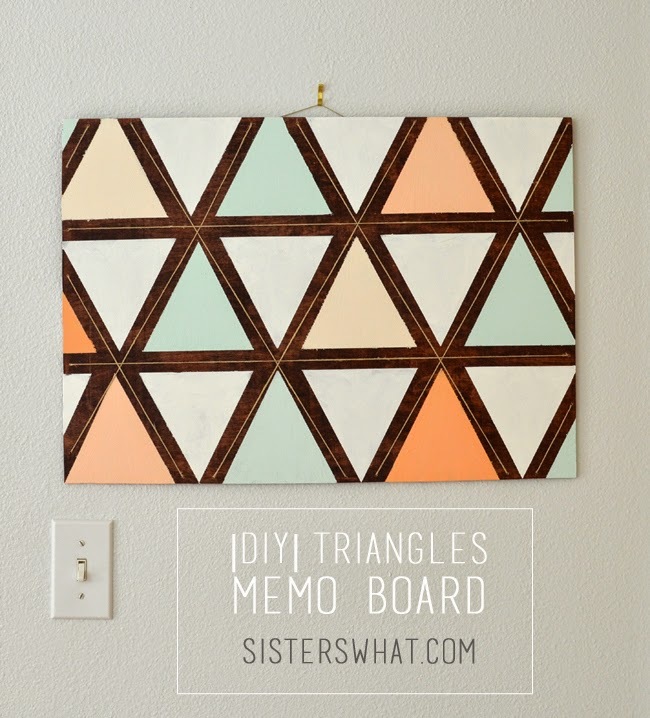 ' DIY Triangle Memo Board - Sisters, What! After about 6 months of moving in, we finally put something up on the walls. The hubby has been wanting to put all our pictures up for ages, but for the past 7 years we've lived in 6 different places so our few pictures were meant for a standard rental look. Now that we're permanent, I wanted to change things up. However, I really am far having an eye in interior decorating, but I figured if I take my time and do one room at a time (with lots of help from pinterest) I might be able to pull something that is totally us off. 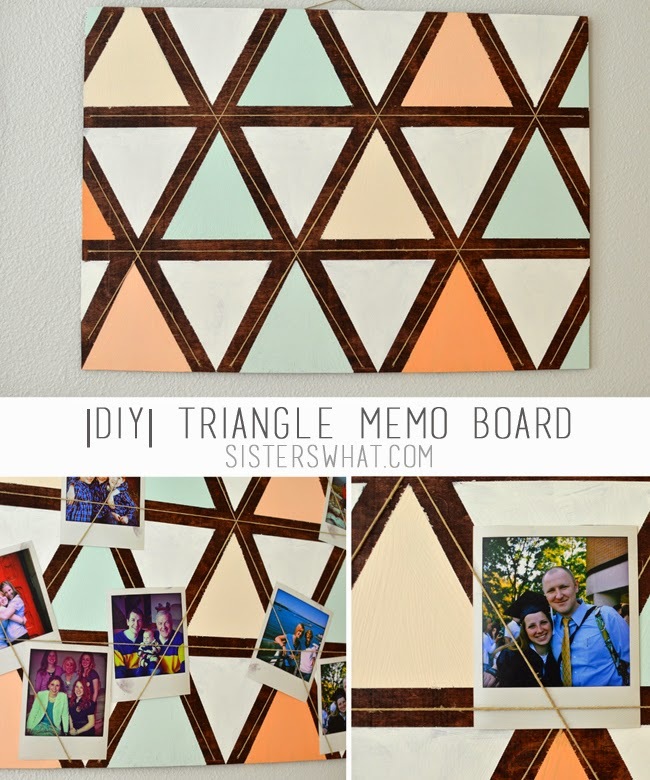 We both missed having family pictures up, so I finally got around to making this triangle memo board. 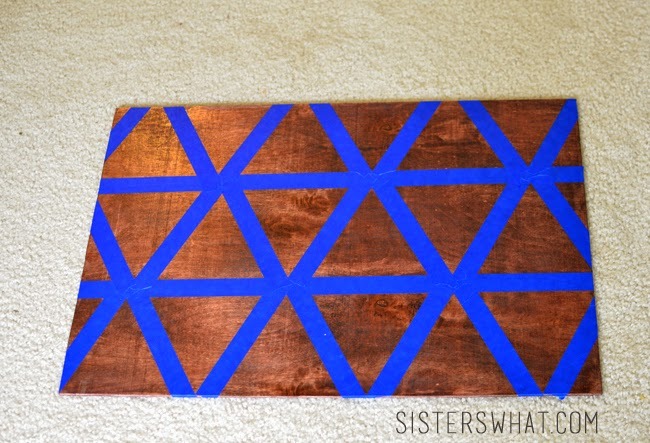 I had the idea from when I made a fabric/ribbon memo board in high school. I love how easy it was and that it actually turned out as I pictured it in my head. Here is Captain Awesome helping me hang it. Hubby felt it important to commemorate the hanging of our first thing ever on the wall. 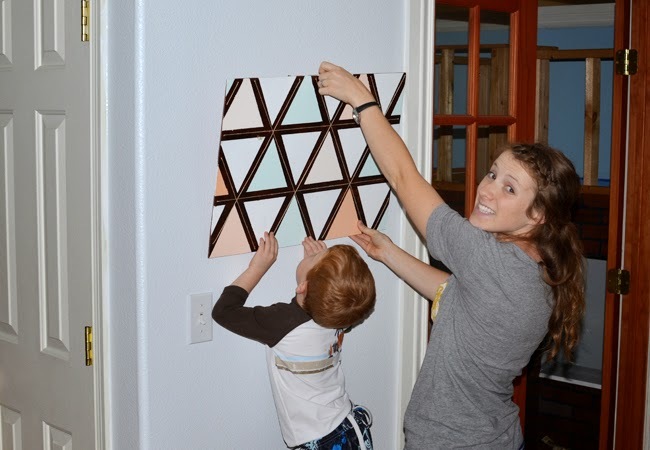 |2| then I made a rough triangle stencil and taped around the triangle then moved the triangle upside down and repeated. Like I said it was rough and not perfect, but it was what I generally wanted. 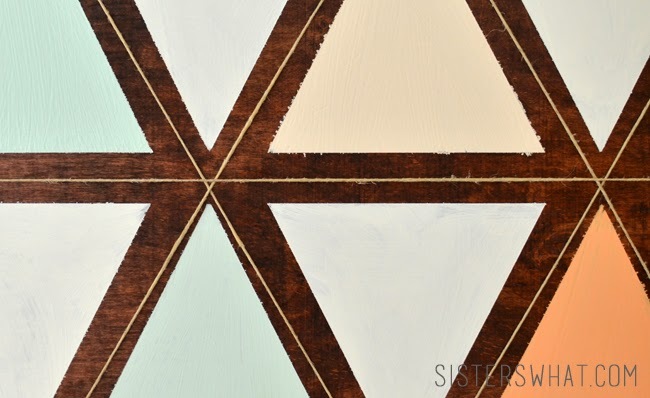 |3| Then I picked my color combination and painted. Because of the dark stain underneath I probably had to do 3-4 coats of each color. |4| after everything was dried, I pulled the paint off. 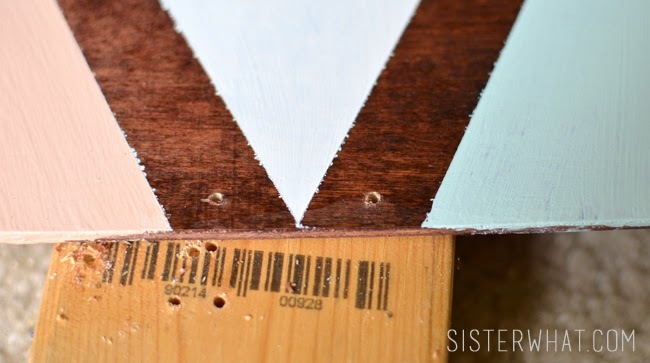 Then I drilled small holes (big enough for the hemp/twine) on each edge; one hole on each stain line. |5| in no particular order (because that is just how I do things) I started stringing the hemp/twine through each hole over all the lines; from the back to the front and again. There was no rhyme or reason, i just did it until all the stained wood lines were covered string. After you get it all covered, make sure your string is pulled tot. Anyway, I hope that makes sense. I was worried my pictures might not hang well, but they hang really nicely and don't slip at all. I love how I can easily add or subtract pictures at will. Looks great. Your helper is a cutie. Love it!! Turned out so cute, I love the triangles. Want to also invite you to come link up to Bewitchin Projects Block party going on right now and every Sunday morning! Super Cute and the colors look so good. So cool. 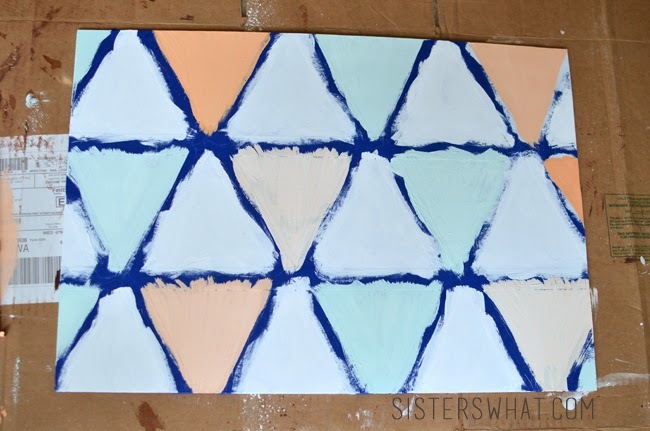 And love the colors you used, too! Thanks for sharing at Link it or Lump it!